The wave of Stories overwhelmed the majority of social media platforms. Instagram, Facebook, and even Excel! copied the original Snapchat idea allowing users to create 10-second stories that disappear 24 hours after sharing. Instagram was the first social platform to copy Snapchat with a slightly updated version of 15-second full-screen 9:16 visuals. Now more than 300 million people view Instagram Stories on a daily basis. In case you’re using social media templates you can ease ads creation significantly. Of course, businesses couldn’t lag behind this potentially powerful tool. This feature was launched back in January 2017 but is already actively used by brands and businesses. The ads appear as an image or 15-second video in the Stories section. They have a “Sponsored” marked label and include an external link. Instagram Stories ads are set up similarly to regular Instagram ads in the Feed. 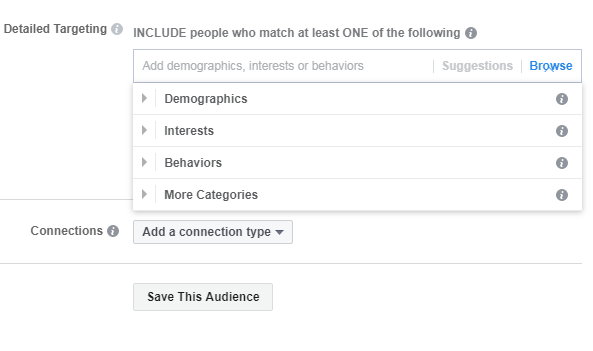 You specify your target audience in the settings using certain criteria like gender, age, location, interests etc. But if I had to choose between both, I would definitely opt for Stories. Why? Some sources claim Instagram stories have a 23% higher conversion rate than Feed ads. Consequently, Stories ads remain cheaper than ones shown in the feed. Quite a strange paradox but definitely worth a try! This is how effective Stories ads can be for your business. In this guideline, I’ll show you how to create, customize and manage highly-effective Stories ads on Instagram. How Do You Set Stories Ads on Instagram? Yeah, you read it correctly. 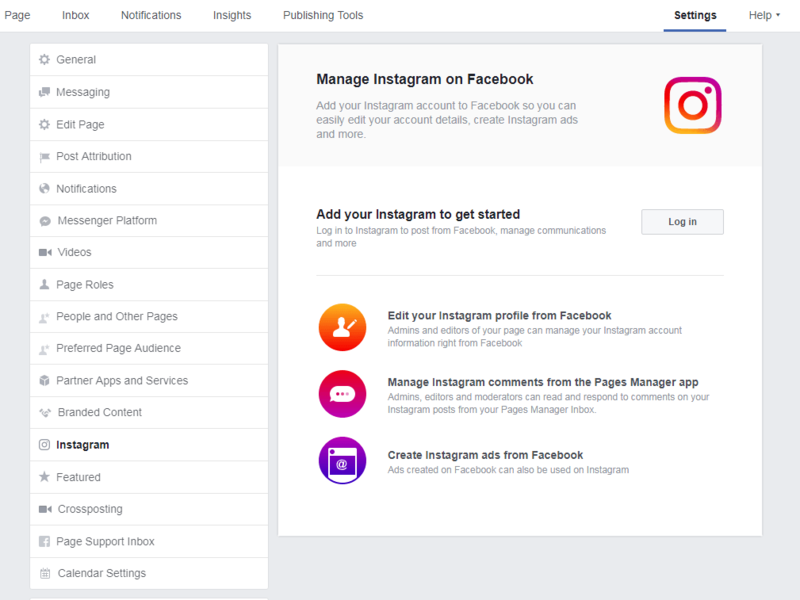 Since Facebook bought Instagram several years ago, one cannot operate without the other. All ads are regulated by FB Ads Manager that you’ll find only on a Facebook business page. So in case you don’t have one (and you most likely do because you got one while setting up your Instagram business profile), I will remind you. 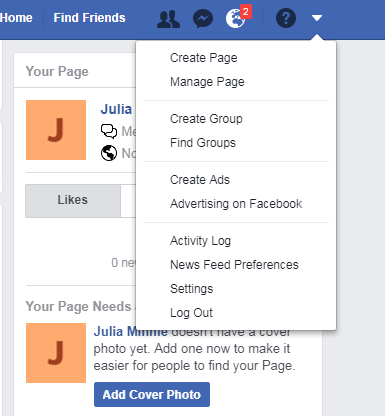 Click the drop-down menu at the top right of your FB personal account and choose “Create Page”. You can create a page within 2-3 minutes. 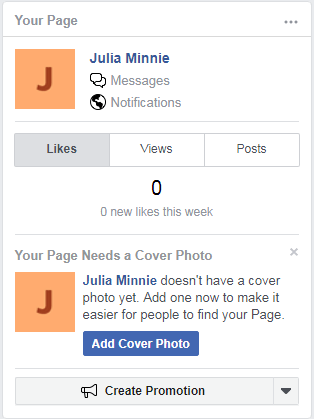 It’s not even necessary to complete one with photos and descriptions, but I will recommend every business to have a well-designed Facebook business page too. 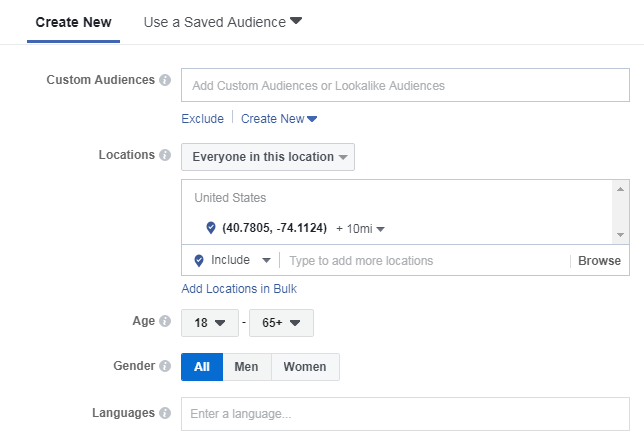 Story ads are displayed by default on behalf of your Facebook business page. But, if you want the ads to be shown on your Instagram page, your profile must be linked to FB. On the homepage of your FB personal profile, you will see the info on your business page(s). Just look at the top right. Go to the “Settings” and select “Instagram” from the big menu. Now you need to press “Log in”, enter your login and password. Good job, now you are ready for the setup! Going back to our drop-down menu, click “Create Ads“. 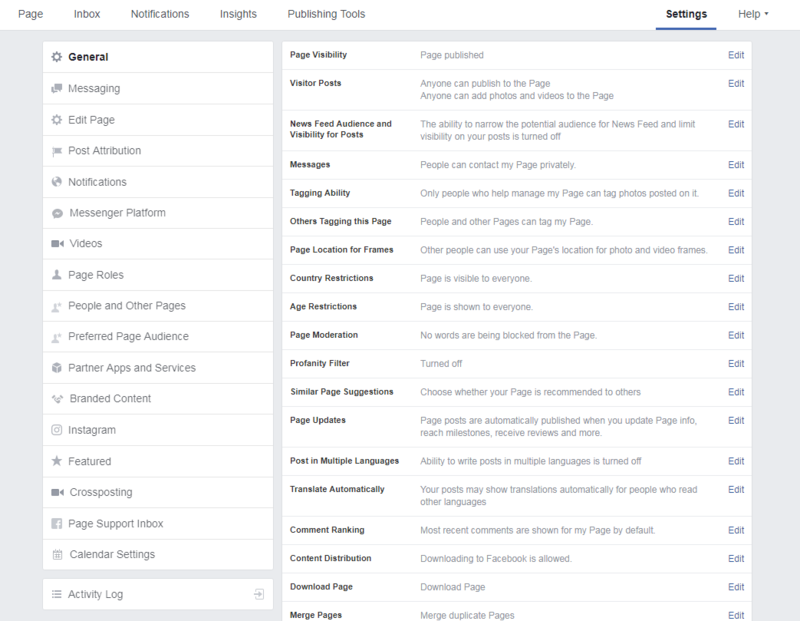 Now you are in the Facebook Ads Manager. The first thing you need to do is select the marketing objective. 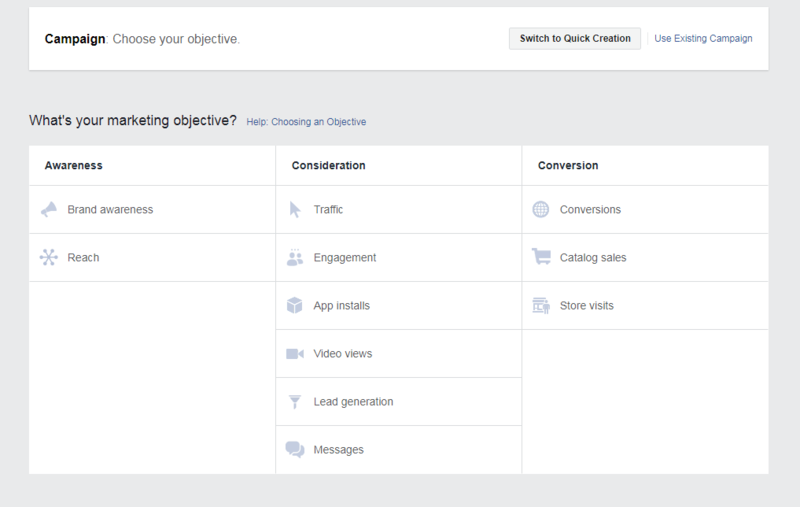 What is a marketing objective and how do you select one? By choosing one of the 11 goals, you sort of tell Facebook what results you expect from running this ads campaign. Earlier, if you wanted to make Stories Ads on Instagram, you were limited to only 1 objective – “Reach“. But honestly, that is not the best goal for these types of ads. The choice depends on the task that you pursue. If you need help, click the “Help: Choosing an Objective” button. The most common marketing objective is “Traffic“, so I’ll choose one too. 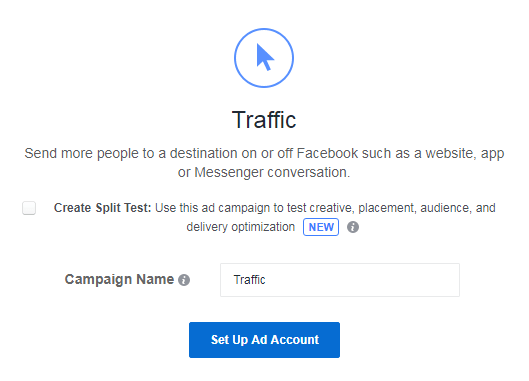 Finally, choose the campaign name (do not confuse with the ad’s objective) and hit “Set Up Ad Account”. 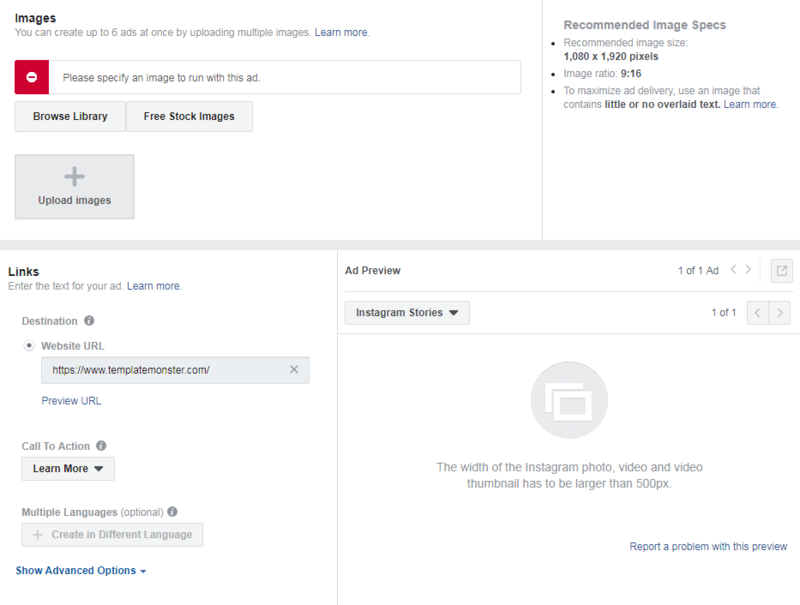 If you have never posted ads on Instagram or Facebook, you’ll need to set up an ad account. Choose “Website” if you need people to be redirected to your website OR Instagram profile. Now you need to target the audience that is going to see your Stories Ads on Instagram. Detailed: demographics, interests, and behaviors. Pay special attention to detailed targeting. You’ll be able to promote your business in the Instagram Stories to those people with certain interests. For example, if you sell surfing boards, you can show ads to people who are fond of surfing. 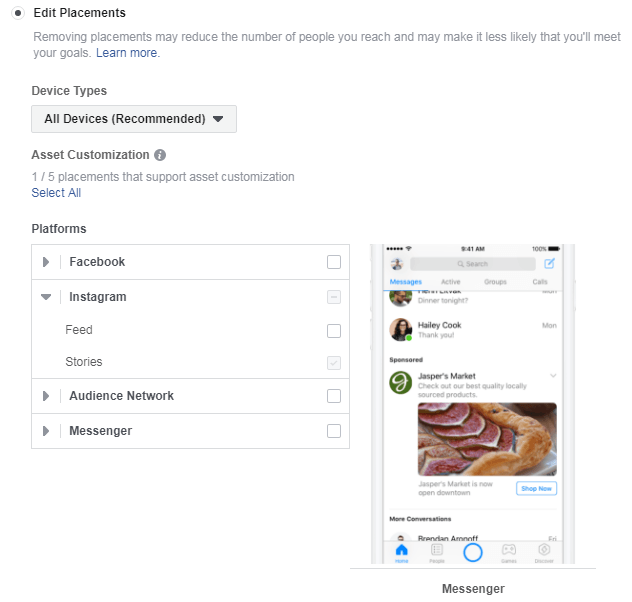 If you choose the automatic placements, all ads will be shown on Facebook, Instagram, and FB partner apps like Messenger. But we are only interested in Stories Ads, aren’t we? Choose the “Edit Placements” option and remove the check marks from all other options except Instagram Stories. Lifetime budget: the maximum you’ll spend during the lifetime of your ad campaign. 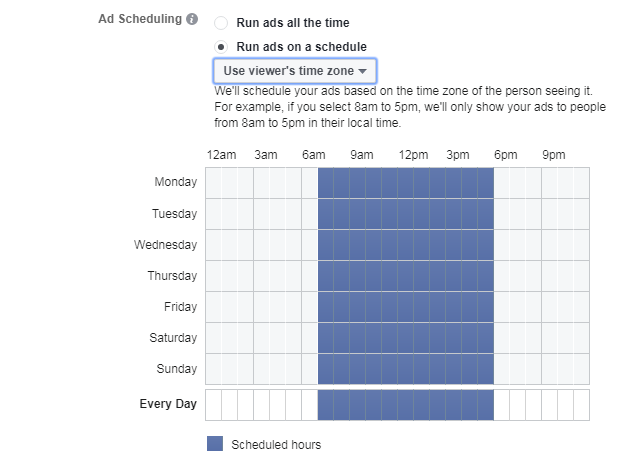 If you choose the Lifetime Budget, you will be able to schedule ads by days, time of the day and the timezone. 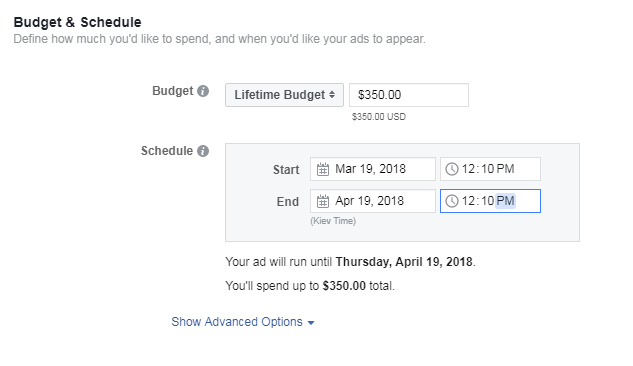 If this is the first time you have ever set up ads through FB Ads Manager and you have no idea what the size of your budget should be, I recommend starting with $3-4 per day. Watch for the results after the first couple of days and you’ll know for sure how much you need to spend on Stories ads. Now that you know what Ad Scheduling is, scroll a little higher. You’ll see the Bid Strategy section. This is a place where you can set a bid cap. You will see that Instagram determines the cost per click automatically (it’s called the “lowest cost”). If you want to set the price manually, put the checkmark on “Set a bid cap”. DO NOT put the super low price per click, otherwise, Instagram will not show your Ads. Which one is better for your promo? Let me explain about each separately. The ad consists of 1 image displayed in between the person’s Instagram Stories for 5 seconds. This is the most common ads format on the social platform. Look at the example below. Compared to single images, the video can last up to 15 seconds. Believe it or not but videos on Instagram work better, especially when it comes to ads. With the help of videos, it’s a better way for a brand to convey the idea of its product/service. Agree? Okay, my friend, now it’s time to make your own Stories Ad! It’s easier than you think. After you fill in all the elements, you will see a draft of your ad on the right. Since the ad doesn’t last long, your task is to make a super effective advertisement that gets maximum of clicks on the relevant link. To do so, use a short but impactful text message that offers people a solution to their problem. If you CAN use video – use it! Typically, video ads show better results than image ads. Test it and you’ll see for yourself. Also, I would recommend you make a live video for your ad. What I mean is, make a video where you show yourself or real people. Users put more trust in brands when it comes to real and live experiences. To redirect themselves to your website, the viewers need to drag their finger from the bottom up or click the link at the very bottom of the ad. However, not all users actually know about this. I highly advise telling people in your ad what they need to do. Or simply place an emphasis on the button using arrows or highlighting. Before you choose one of the three, you should know that Facebook offers 2 types of ads accounts – postpaid and prepaid. In this case, you pay for the Instagram ads in “credit”. 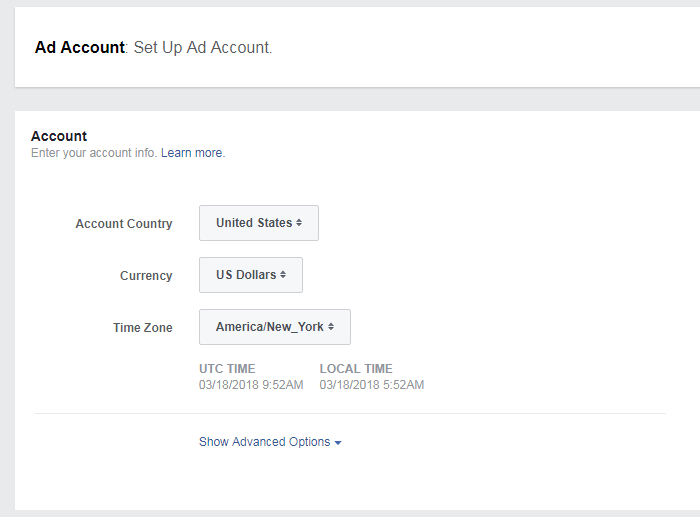 After connecting your payment card and launching your ads, Facebook will take the money right away. It will wait until you spend a certain limit (you can customize one yourself). But there is one main disadvantage of the postpaid account. You can lose some money if you do not control the budget and forget the date when the campaign is going to be over. In this case, you first put a certain amount of money into an ads account and then launch the Ads. As soon as the money runs out, the campaign stops immediately. Which of the 2 ads accounts should I choose? The choice of your account type depends directly on which payment method you select. If you choose a credit/debit card or a PayPal account, then your account will be postpaid. For more information on prepaid options in your countries, look here. Choose the payment method, enter the data and click “Next“. After launching an advertising campaign, it must pass the moderation process that usually lasts from 15 minutes to 4 hours. But the chances are you will not have to wait more than 30 minutes for an approval. How Much Will Instagram Stories Ads Cost Me? The Ads format: video or image. The targeted action you want your users to do. Do you want them to watch a video, visit the website, make a purchase or simply follow your Instagram profile? The cost of your service/product. On average, Stories ads are cheaper than Instagram ads shown in the Feed. Although, if you want to know real figures, do a test. Take a small budget ($ 3-4 per day) and launch the ads for several days on this budget to see how it works. The results will give you a clue as to what you should change in your campaign to make it more effective. Yeah, this long guideline is finally over. But if you read it to the end, you are now fully aware of how to create Stories Ads in practice. This is a secret weapon for your business that will help you gain followers, collect an email database, sell products/services and much more. 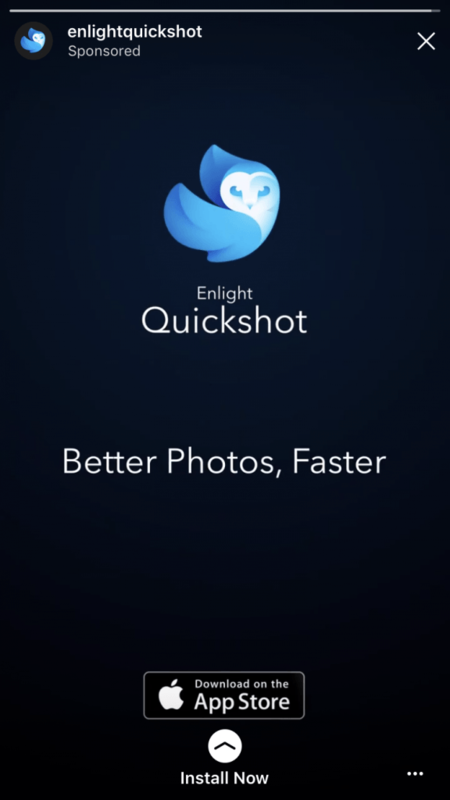 Start using this feature for your benefit right now!